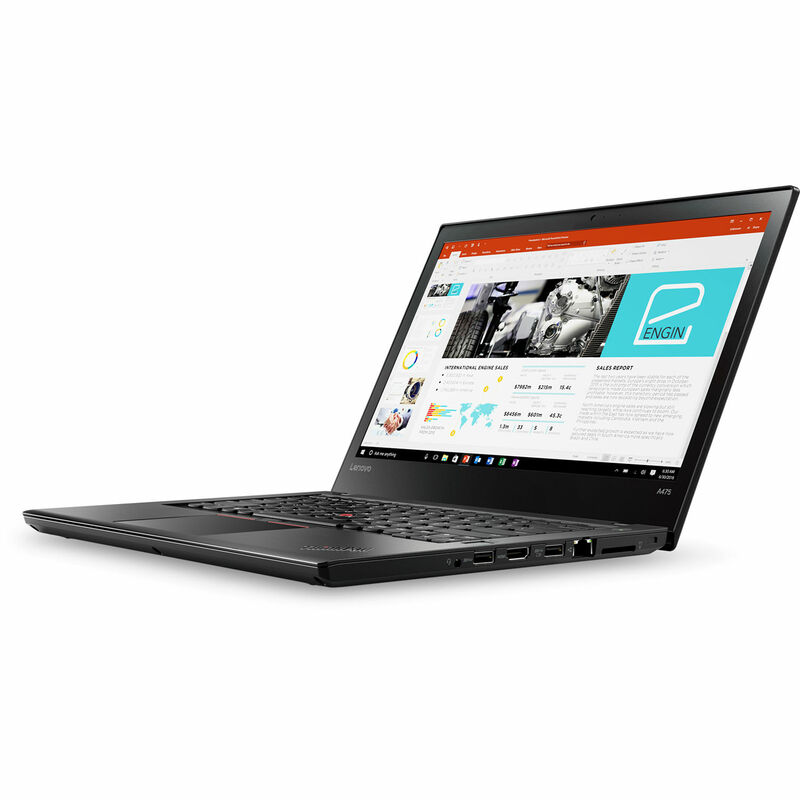 The Lenovo 14" ThinkPad A475 Series Notebook is an AMD-based computing system that runs on a Windows 10 Pro operating system, so you can type reports, create presentations, and more. The AMD Pro A12-9800B processor is well suited to handle multiple software programs at the same by coming armed with four cores, which operate between 2.7 and 3.6 GHz frequencies. To assist in running multiple apps, Lenovo has equipped this notebook with 8GB of RAM. Moreover, there's a 256GB M.2 NVMe Opal 2 SSD for quick boot times and access to files. The Lenovo ThinkPad A475 sports a 14" IPS display that has a native resolution of 1920 x 1080, which is powered by an integrated AMD Radeon R7 Graphics chipset. You can extend the visuals to 4K displays, utilizing the notebook's HDMI and USB 3.1 Type-C outputs. To complete the multimedia package, the A475 has two 2W speakers. In addition to the USB 3.1 Type-C port, the ThinkPad A475 notebook is outfitted with three USB 3.0 ports to access printers, storage drives, and other useful USB devices. For Internet and network access, it offers 802.11ac Wi-Fi along with Gigabit Ethernet. Other notable features include a built-in 720p webcam, microphone, 4-in-1 memory card reader, fingerprint reader, and Bluetooth 4.1 connectivity. Additionally, powering the notebook is accomplished with a two-battery system that provides up to 10 hours of use while you're traveling. Box Dimensions (LxWxH) 18.5 x 11.8 x 3.0"
14" ThinkPad A475 Series Laptop is rated 4.3 out of 5 by 7. Rated 4 out of 5 by Brendon G from Does great for its intended purpose I bought this laptop a month ago and I’m pretty happy with it. It was more than half off in the lenovo outlet. I upgraded the HDD to an SSD and that was all I really needed to change. The screen could be brighter and it would be nice if the micro usb was thunderbolt. But it runs WoW at a good 30-40fps and is great in google sheets. Rated 1 out of 5 by racheal from super slow I hate that I ordered this computer. I have seen snails faster than this lagging thing. Rated 5 out of 5 by Thracy from Terrific laptop A great laptop and as always the keyboard is awesome.